The SJ4000 dash cam is a Chinese camera manufactured by a company called Hongfeng Century. This camera has a striking resemblance to the GoPro family of cameras. In fact, many of the GoPro accessories and attachments work with this camera (Note the GoPro batteries are not compatible). Unfortunately, like the GoPro cameras, SJ4000 is not the most discreet when used as a dash cam. The SJ4000 comes in 7 colors but you probably want to stick with black if you use this as a dash cam. The camera has very good picture quality during the day and average picture quality at night. Some owners complain of a bluish tinge in the videos but this does not effect every camera. The SJ4000 records 1080p at 30f/s with an average bit rate of approximately 15,000kpbs. Like many of the cameras released in the last year, this SJ4000 is based on the Novatek NT96650 processor and the Aptina AR0330 CMOS sensor. This camera does not come with a G-sensor or GPS but it comes with a 1.5″ LCD screen. Size is not too large at 59.27 x 41.13 x 29.28 mm but the camera is still quite noticeable due to its form factor. If you plan to use the SJ4000 as a dashboard camera, you will likely need to purchase the Car charger / adapter and car bracket / mount separately. Most vendors do not include these accessories with the SJ4000. In August 2014, Hongfeng Century released a WiFi version of the SJ4000. This camera is identical to the original SJ4000 but the added WiFi feature. Android and iOS apps are available to support this feature (search for SJCam). If that does not correct the problem, the camera may be defective. Some owners have indicated that the camera only works when connected on USB. This is due to a bad battery. To correct the problem, replace the battery. Others have indicated there is a small piece of white tape over the battery contacts. This may prevent the battery from making contact to the camera. Removing the tape will correct this problem. Many owners have complained that the USB is weakly soldered / mounted on the circuit board. When inserting or removing the USB cable, the port can break or snap away from the circuit board. To fix this problem you will need to disassemble the camera and resolder the port. The door for the battery cover is unattached. Some owners have lost / misplaced this cover. Also the battery compartment catch tends to jam in a diagonal position when trying to close. Ideally the cover would be attached to the case. While the SJ4000 comes with many mounting attachments, the smooth surface of the attachments prevent them from gripping. A solution is to sandpaper the attachments which provides more grip. Some owners indicate the camera will freeze on the “Welcome” screen. There are no known solutions for this problem but it would make sense to try a different Micro-SD card and a different battery. Many users have indicated that the power button does not work with a normal press. Users would have to press very hard or for a long time to get it to work. To fix this problem you will need to disassemble the camera and put a small piece of electrical tape on the button for the camera. This extra piece of tape allows for the button to work correctly. The following video shows how to repair it. There are at least 2 versions of the SJ4000. When trying to upgrade a camera with the incorrect firmware, users have experienced a white screen of death. To resolve this problem you will need to flash a compatible firmware for your camera (firmware downloads are provided below). The following video illustrates the problem and the fix. One owner has indicated this camera has a significant amount of background noise when used as a dash cam. Typically these problems are due to the power charger but we have not been able to confirm if that is the case for this camera. One owner has claimed that he has had 2 charging cables explode / burn up. The camera becomes unresponsive once this happens. 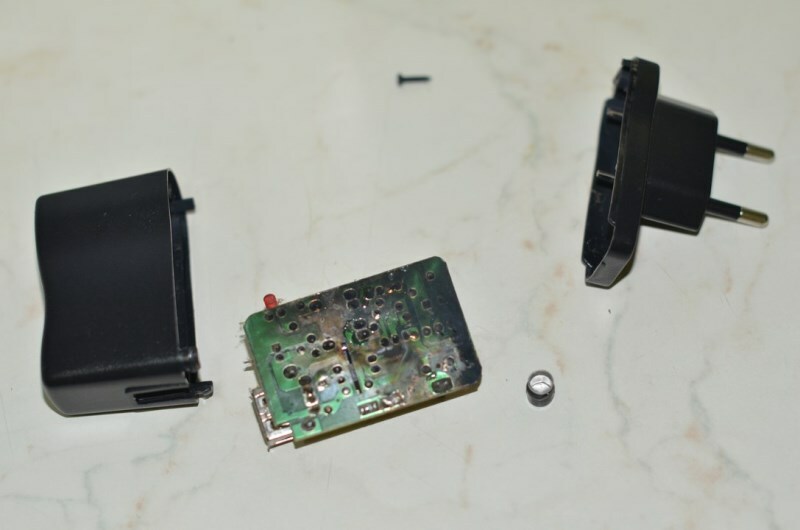 Below is a picture of the disassembled charging cable with the damaged circuit board. Life, Tech and Moto has created a good teardown video for the SJ4000. RCGroups have created detailed instructions and pictures for disassembling the camera. Note that disconnecting the display ribbon cable is very easy if the clear screen cover is removed from the back of the camera. This is only held on by adhesive, and can be pried up from the camera body using a fine screwdriver. This enables the LCD display to be lifted clear, exposing the ribbon cable connector. While the camera appears to be a great action cam or a GoPro on a budget, we consider this to be an average dash cam for the money. The video quality is on par with other NT96650 + AR0330 cameras and the price is reasonable for approximately $100. Unfortunately, it is not the most discreet. We prefer the Mobius which is based on the same chipset but is much smaller and more affordable. However, if you are looking for a more versatile camera that can be used as an action camera and a dashboard camera, this one is a reasonable purchase. Build quality and reliability appear to be average but that is expected at this price range. Overall a great alternative to a GoPro camera and is a reasonable choice if you are looking for more than just a dash cam. Upload the Firmware (.bin) into a BLANK microSD card. With the Camera switched OFF, insert the microSD card into camera. Once microSD inserted into Camera, switch ON camera. Blue and Amber LED will light up, indicating Camera is switched ON, but SCREEN will be BLANK. Wait for about 15 seconds, the Camera will auto power up. Once camera (screen) comes on, go into General Settings to change the Language back to English and check for the VERSION. FORMAT microSD from the Camera. Done. Note: Camera will auto-read microSD when it is powering up each time, hence, if the card is not formatted / firmware deleted, it will auto-install each time it is switched-on and may lead to the software crashing. Note there are 2 versions of this camera available. The older version (version 1) has different hardware and LCD screen (typically sold before April 2014). Only v1 firmware works with this camera. The newer cameras come with different hardware and LCD screen (typically sold April 2014 and later). These cameras come with v2 firmware. The latest firmware is now available on the SJCAM site. Final Word A GoPro clone for a much more reasonable price. Great as an action cam but as a dash cam, the Mobius has similar features for a better price. Reliability and build quality is average but a reasonable solution if you are looking for a versatile camera.